This year falls on the Chinese zodiac Year of the Horse. The jūnishi or twelve symbols of the Chinese zodiacs are horary signs based on the point at which Jupiter can be found annually as it makes its twelve year orbit round the sun. The zodiac is divided into twelve parts with a particular Chinese character attributed to each point; the twelve animals were introduced later to help make each point easier to recognize. Evidence from archaeological excavation indicates that this Chinese astrological system was prevalent in Japan by the Kofun period (c. 3rd century – 538). However, according to recent research, equines were not domestic to Japan in the Jomon period (c. 10,000-300 BC) and the early fourth century Gishiwaden, a Chinese text about Japanese geography, tradition, culture, society and foreign affairs, refers to Japan having no cows, horses, tigers, leopards, sheep or magpies. If this is true then horses did not exist in Japan until at least the third century. Once in the strictly hierarchical Kofun tumulus period, there is evidence that horses were available to those with considerable authority. Their exalted status bred legendary tales of noble beasts, for example the stories of Emperor Jimmu and his prized horse Ryūseki, Nomi no Sukune making a horse haniwa, or burial effigy, for Emperor Suinin, and Yamato Takeru setting out on his eastern expedition on horseback. In these legends, the ancient Japanese elevated horses into manifestation of gods who traverse the spiritual and secular worlds in horse form. A creature of higher order, horses were presented to shrines as offerings of supplication or gratitude in a custom called kemba. Over time, horse-shaped objects or illustrations of horses replaced live animals. This led to the development of ema, or illustrated votive plaques. Although horses dominatedema, especially in ancient times, images on the plaques were not restricted to horses. Warriors, ships, animals of the Chinese zodiac and scenes from famous ancient tales and festival ceremonies were also depicted. Some plaques, though referred to as ema, contained no image, but instead showed text and numbers, being poems and mathematical equations. During the Muromachi period (1392-1573) there were artists and merchants dedicated to producing custom emaplaques, and by the Edo period (1615-1868), there were established specialistema shops on Kōraibashi-dori in Osaka and Asakusabashi-dori in Edo (present day Tokyo). The ema came in a variety of shapes and sizes, but most were either rectangular or rectangular with pitched sides, resembling a crudely drawn house. Some were framed or were freestanding on legs. 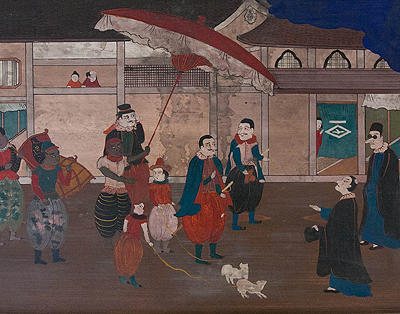 Large format ema or Ōema painted by professional artists were widely available and were bought both as votive offerings and for aesthetic pleasure. One famousōema is a late Muromachi period pair in the Kamo shrine in Tatsu city in Hyogo Prefecture painted by Kano Motonobu II (1476-1559), which is designated an Important Cultural Property. Smaller ema plaques popular with commoners often have a folk art quality. They retained a functional spiritual purpose as remedies for everyday troubles, from curing illness to tackling alcohol and gambling addiction. Visitors to the Lisa Sainsbury Library may have spotted a painting of Portuguese people perambulating a shop-lined street on a freestanding wooden plaque behind the Librarian’s desk. Most ema are inscribed on the reverse with the devotee’s name and wish, and to which shrine or temple the offering was made, as though to help the gods identify the supplicant. 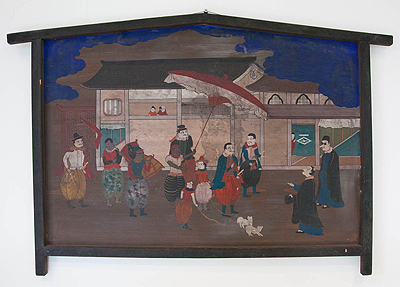 The ema in the library, however, has no such inscription, and its crude brushwork and unusually vivid colours, particularly the blue used in the sky, suggests that the image was painted by an amateur artist in the Meiji era (1868-1912) or later. According to its donors, Sir Hugh and Lady Cortazzi, they bought the votive from an antique shop in Hiroshima in the early 1980s. While perhaps not exactly a ‘Treasure of the Library’, our ema is most certainly a charming conversation piece.